Why is horizontal scrolling in a bottom tab bar commonly discouraged? Both iOS and Android guidelines discourage it. I can think of these possible reasons of why it's not recommended. Psychologically it's counter to our expectations. We expect lower things to be more static and stable. We more easily understand fluid navigation when it's at the top area of the screen, but in the bottom we are thrown off. It's awkward for the human thumbs to reach down there. With the "thumb zone" that bottom right area is hard to reach. Are there others reasons? Has anyone studied this? Thoughts? Or is it actually okay? Is there way to do it right? Has it ever been done well? Aside from what you already mentioned, I'd say that if you have so many items in your bottom navigation that it needs to scroll, you're doing something wrong. Material.io mentions "3-5" for a reason. Anything beyond that is too difficult to keep straight. Plus, the bottom navigation is meant to be a direct link to main pages of the app. If you have to scroll to get to them, it defeats the purpose of having them there. Scrolling navigation works better at the top because it's almost exclusively used for subitems of a main navigation instead of for the main navigation itself. That model works better because you're searching for something more granular and would expect to scroll through 5+ items to find what you need. Because bottom navigation actions are presented as icons, they should be used for content that can be suitably communicated with icons. Don't: Avoid truncating text labels as doing so may prevent comprehension. Don't: Avoid shrinking text labels to fit on a single line. If we apply these rules: not using more than 5 buttons, use icons, use short labels, then there shouldn't be need to overflow content. The idea is to keep the bottom bar simple with the minimum necessary links to the most important views of the App. While Tabs don't have this minimum or maximum limitations. Not the answer you're looking for? Browse other questions tagged mobile navigation ios scrolling guidelines or ask your own question. Is Tab Bar based iOS Design for feed driven apps a better UX? Why does scrolling when dragging an element scroll faster on mouse wiggle? How important is it to stick to the platform guidelines in mobile app design? 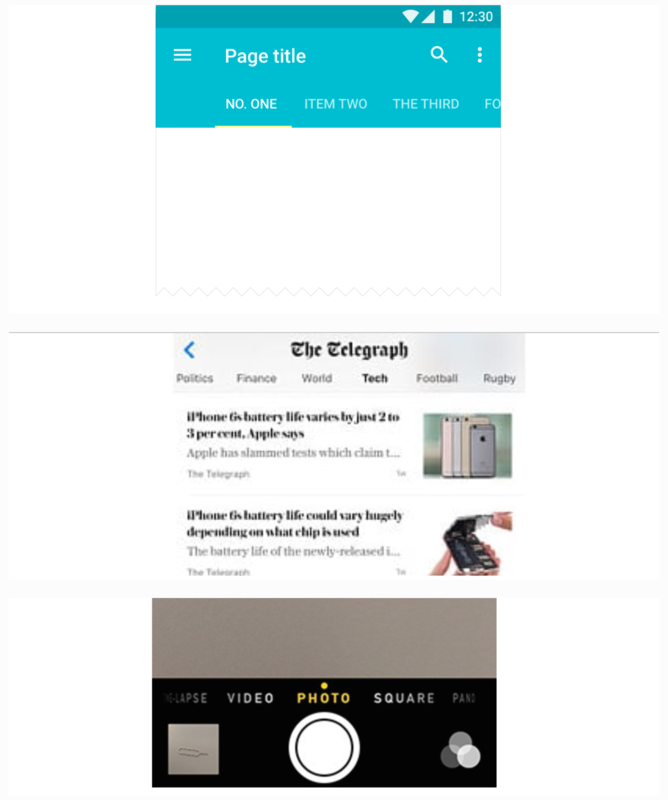 Why isn't it common to swipe between top-level views when we use a bottom navigation?